Advanced Supply Chain, Inventory and Warehouse Management software allows companies to consolidate inventory systems into a single, integrated control solution providing visibility into the complete supply chain. A great SCM system allows you to efficiently manage every stage of the product lifecycle, as well as your different lines of business, manage inventory levels and get stronger control of those most important relationships with suppliers. Business Solution Partners are the Supply Chain Management experts - over the last thirty years, we have worked with and integrated many different types of SCM systems to meet our clients ever-changing needs in the global marketplace. Business Solution Partners recommends NetSuite above all others. If your company seeks true visibility into the supply chain, we recommend NetSuite should be at the core of your business. 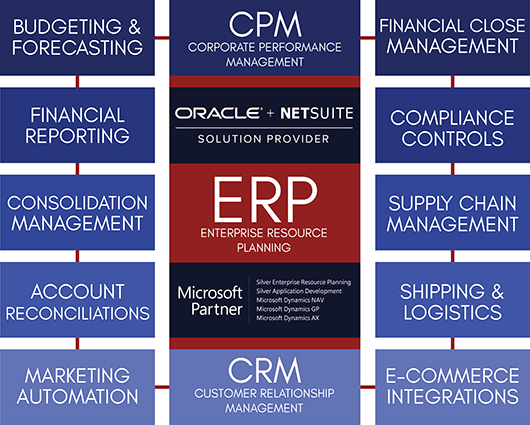 NetSuite is more than an ERP - it's a complete business management solution that extends perfectly into the Supply Chain. NetSuite's advanced inventory, logistics, warehouse management and supply chain systems work together to provide complete transparency - from raw materials to finished product. With NetSuite, you can ensure you have the right materials, in the right quantities, at the right time, to ensure your manufacturing and/or distribution buinsess runs smoothly. In one place, shippers get: Easy Carrier Selection, Multiple Modes, Simplified Shipment Processing, Spot Quote, Reporting & Visibility, Web-Based SaaS, Systems Integration, Carrier Communication & Robust Customer Support.